This is a 3 cell Marley Cooling Tower we are currently repairing in Durham, NC. Its in rough shape the hot water basins are completly gone along with the side walls. This is causing the fill media to fall out of tower. 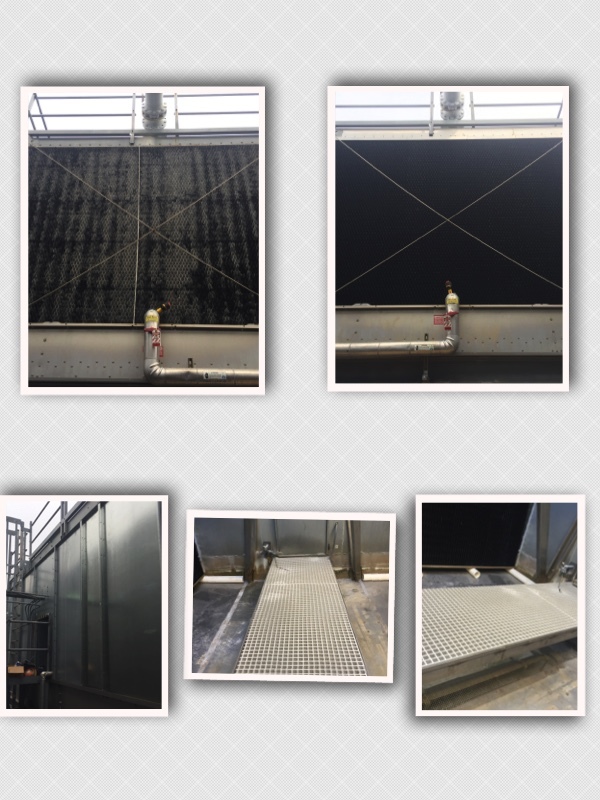 For this Marley cooling tower repair are installing new Stainless Steel hot water basins with new PVC metering orifices, 8 new G235 galvanized steel side walls per cell, new high performance film fill media, and new stainless steel and FRP Custom internal platform. Another Transformation By the Cooling Tower Experts at Towers Inc. Cooling Tower Specialists. Call us at 336-869-0011 for your free inspection. Let us show you how…We Tower Above The Rest! Are Cooling Tower Cleanings and Preventive Maintenance Necessary? We have extensive experience in new tower erection, service, refurbishing and preventative maintenance of cooling towers for customers in North Carolina, South Carolina, Virginia, West Virginia, Tennessee and Georgia. Our service areas include but are not limited to Greensboro, Winston-Salem, Raleigh, Durham, Charlotte, Columbia, Myrtle Beach, Charleston, Greenville, Norfolk, Virginia Beach, Portsmouth, Richmond, Roanoke, Knoxville, Nashville, Atlanta and all surrounding areas. Automotive, Brewing, Chemical, Commercial, Electronics, Food, Fuel Processing, Glass, Independent Power Producers, Metal, Medical, Pharmaceutical, Pulp And Paper, Textile and more.